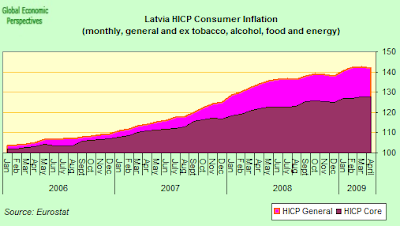 Are The IMF and The ECB Lining Up Against The EU Commission Over Latvia? There was a very interesting and revealing press conference given by IMF First Deputy Managing Director John Lipsky and European Central Bank governing council member Christian Noyer in Paris on Thursday. 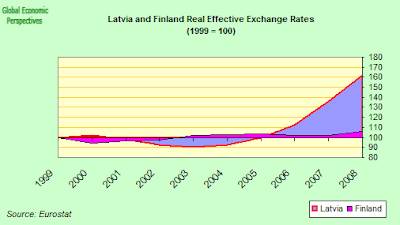 Christian Noyer said that, in his opinion, Baltic countries like Latvia would not be helped by joining the single currency (the euro) prematurely. "It's in the interest of candidate countries not to enter too early because it risks making the economic situation unbearable," Noyer said. "If there is a solution it begins with macro policies," Lipsky said. "No single exchange rates solution, or exchange regime represents a solution to these kinds of problems. What is important is that the currency regime is credible and coherent". Do I detect a shift in emphasis here? 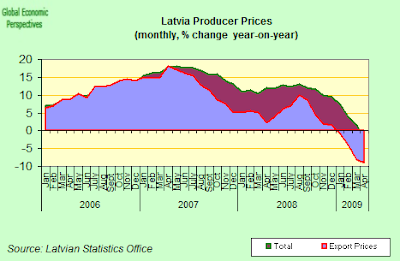 Certainly Latvia's currency regime is not credible (most external observers now consider devaluation inevitable), nor is it - in my opinion - coherent. And there has only been a deafening silence coming out from the IMF in recent days on the topic. The EU finance ministers have decided to support maintenance of the peg, but that is hardly surprising, however, Swedish Prime Minister Fredrik Reinfeldt told Reuters, again rather revealingly, that "We think that a clear signal of support from the EU would help them to achieve support from the IMF." That is, the IMF is wavering, and the EU is putting pressure. This, approach, however, suffers from the flaw that it is hardly either coherent or convincing. 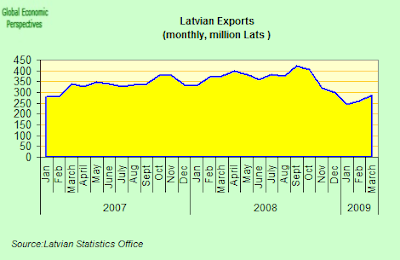 Now the Latvian parliament approved budget cuts of 500 mn Lati for the 2009 budget on June 16, a vote which lead the EU to decide to release the next 1.2 billion euro tranche of the emergency loan to Latvia. So why is the IMF still assessing the situation? Some draw consolance in the idea that the IMF’s share of the program is smaller - only 1.7 billion euro in comparison to the 3.1 billion which is coming from the European Commission. But this is to neglect the strategic role the IMF is playing in the whole process. If the IMF isn't leading, then what is it doing. Evidently, the fissures which may be developing between the Commission on the IMF approaches only serve to draw more attention to the complexity of the whole current EU economic and political architecture. 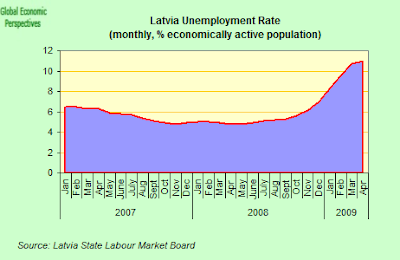 Latvia is a sovereign country, also member of the European Union. Looked at from one point of view, what was the IMF doing there in the first place. But once they have taken leading responsibility, it is not wise for the Commission to try to claw this back from them. After all, the whole process is supposedly intended to raise investor confidence, something which is hard to do if there is not unity of purpose. 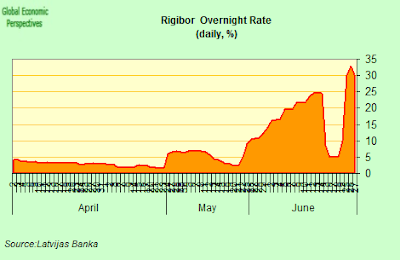 Meanwhile liquidity conditions continue to remain tight, and Rigibor interest rates shot up again at the end of last week, following the termination of the summer solstice holiday. 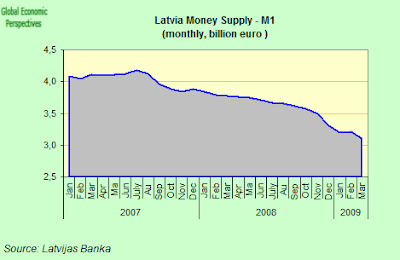 The last official news we have said simply that the IMF would decide on the Latvian loan after June 26. Well we are now after June 26, and we are still none the wiser. 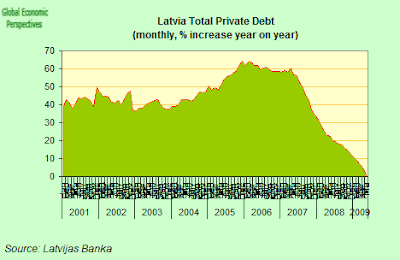 Meanwhile Latvian's continue to save, and outstanding private debt fell in May to 14,140.2 million Lats from 14,252,4 million Lats in April. They year on year change is now down to only 1.6%, and will more than likely turn negative in June, which means that, with the government also trying to save hard, continuing contraction is completely guaranteed without exports. And today we have two additional pieces of relevant news. Firstly, and most interestingly, former IMF chief economist Kenneth Rogoff - now a Harvard University professor - has said the IMF made a mistake, and should never have allowed Latvia to keep the peg. (That is, he agrees with what Krugman and I have been arguing all along). The IMF, however, is still maintaining an apparent vow of silence on the whole situation, or so it seems, and have yet to pronounce. Hello, EU Commission, how can you lose your heads, when all around you are keeping theirs? 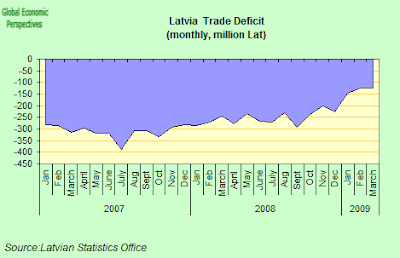 Latvia should devalue the lats to avoid a worsening of its economic crisis, said Kenneth Rogoff, a Harvard University professor and former chief economist at the International Monetary Fund, in an interview with Direkt. The IMF made the wrong decision when it allowed Latvia to keep its currency peg, Rogoff said in Visby, Sweden today, according to the Swedish news agency. While a quick devaluation would be best for Latvia, Rogoff doesn’t believe it will happen for a long time because the IMF and Europe will provide the Baltic nation with loans, Direkt reported. 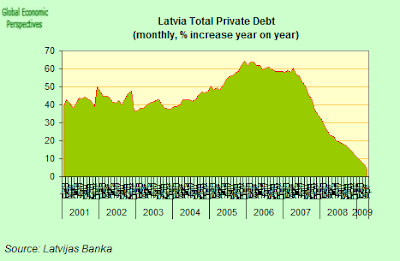 In a normal situation, Latvia would already have devalued the lats and defaulted on its debt, Rogoff said, according to the news agency. 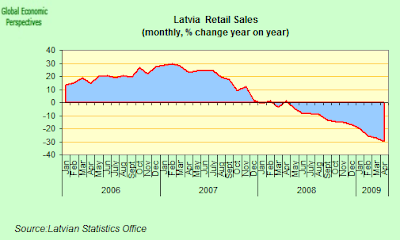 World leaders have decided no countries should be allowed to fail and Latvia is benefiting from that, he said. Secondly Central bank governor Ilmars Rimsevics has given an interview to Reuters TV. He will go down with his ship, like every good Captain should, but there will be no lifeboats for the rest of you. Latvia will stick to its currency peg and not devalue, even if the country fails to win further loans from the European Union and International Monetary Fund, its central bank governor said on Monday. "People who are expressing that (a devaluation is possible) lack some education and knowledge and I am sorry. 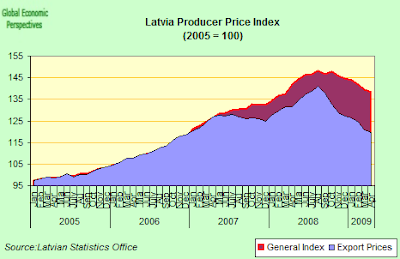 There is absolutely nothing to do with devaluation in Latvia," he told Reuters at the Bank for International Settlements (BIS) meeting. 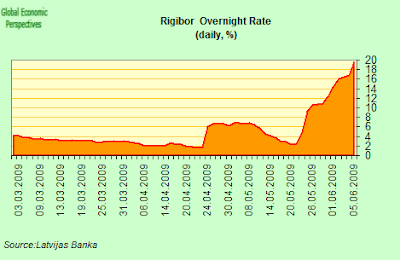 "If the cuts (in the budget) won't be made, there would not be financing available, but that in no way would influence or affect the currency peg," Rimsevics added. The European Central Bank also today urged urged Latvia to rethink plans to siphon off half of its central bank's profits to help rebuild the country's battered finances. 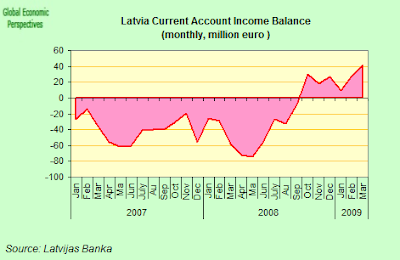 Latvia's government plans to up the amount of central bank profits it takes, to 50 percent from the current 15 percent. 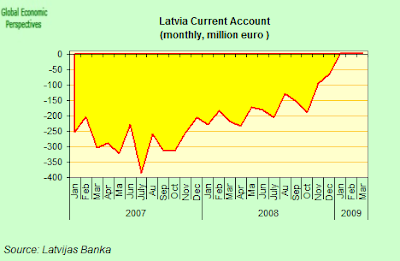 In a legal opinion published on its Web site on Monday, the ECB warned the move risked hurting Latvian central bank independence and wiping out funds designed to be a financial safety net for country's troubled banks. "The use of central bank financial resources may be counterproductive from the credibility point of view if confidence in the financial stability and independence of the National Central Bank is undermined," the ECB said. "It is important to shield the rules related to the distribution of profits from third-party interests and to ensure a legal framework that provides a stable and long-term basis for the central bank's functioning." One of the most crucial questions going forward is will the process of relative price adjustment, while still keeping the peg, be able to balance the economy, or will it turn out to be intolerable, thus leading nevertheless to devaluation in the end. 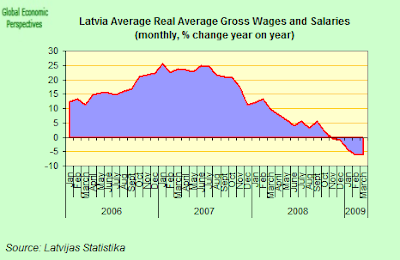 Although wage growth and inflation are slowing, one could ask whether the adjustment is fast enough to enable Latvia to keep the currency pegged. Uncertainty about the answer is likely to keep the devaluation fears as well as the uncertainty in the FX and money markets alive in the future. Well quite, this is one of the things I have been arguing all along, and now those who in theory support the maintenance of the peg begin to "worry" that the rate of price and wage decline may not be fast enough to maintain the peg. Wouldn't it have been better to have thought a little more about this, before embarking on what is evidently such a risky endeavour. At the end of the day what we could really say here is, that in a bid to defend credibility, all credibility has now been lost, and things will only get worse from here on in. Tragedy has already repeated its self as tragedy, and now its about to become one of the sickest of all sick comedies. I think it's time to put a stop to the agony. Consumer Sentiment Rises As Exports Slump - But Where, Oh Where Is The Recovery? 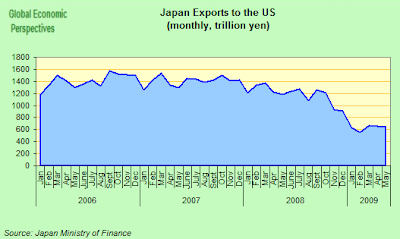 Japan put in a pretty negative export performance in May. Even shipments to China show little sign of improvement, and the general impression is that hopes for a quick recovery in global demand are looking very premature. On the other hand a 42 per cent year-on-year fall in imports in May left Japan with a trade surplus of Y299.8bn for the month - something that will help push gross domestic product back toward growth this quarter, but a trade surplus where imports fall faster than exports is not the same as a surplus where exports grow faster than imports, and certainly for the global economy it isn't. Shipments fell 41 per cent by value year-on-year amid a rising yen and continuing weakness in sales in key markets for electronics and automobiles. May’s year-on-year drop was greater that the 39 per cent one recorded in April, while seasonally adjusted exports slid 0.3 per cent from the previous month, after having risen in both March and April. Nonetheless Bank of Japan data showthat when inflation and currency changes are stripped out, exports were up 5.1 per cent in May. And - depending on what the June numbers look like - exports in the second quarter of the year will certainly be up on exports in the first quarter by somewhere between 7% and 10%. Shipments to the U.S. fell 45.4 percent in May after dropping 46.3 percent in April. 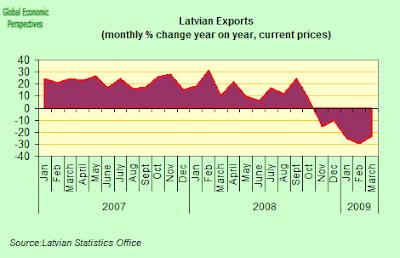 Exports to Europe were down 45.4 percent following a 45.3 percent year on year drop in April. Shipments to China, Japan’s biggest trading partner, fell 29.7 percent, more than April’s 25.9 percent. Exports to Asia slid 35.5 percent from 33.4 percent a month earlier. 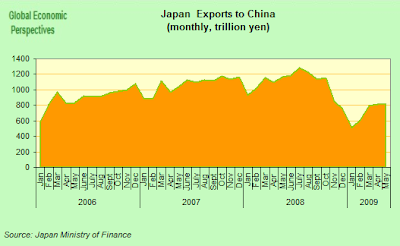 Japan’s exports to the rest of Asia were also well up, over 5% month on month, marking the third straight month of increases. Going by what we have seen so far, it looks like exports to the region will rebound strongly in the second quarter, and we may see growth of 15%+ over the previous quarter, following a drop of more than 20% in the first quarter over the last three months of 2008. But even while exports to countries like Vietnam and Indonesia are rebounding (see chart below) those to India are still falling, and the situation in other a number of other key emerging markets is hardly improving. If China’s exports fall faster than global demand, that opens up space that allows others to cut back less. The alternative — fast Chinese export growth amid a shrinking global economy — would be a sure source of trouble. But China still isn’t really acting as a locomotive for overall global demand growth. 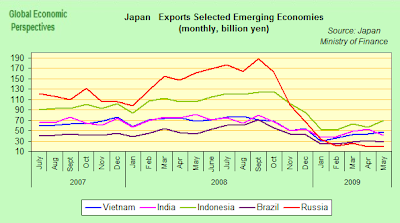 The Export aituation stands in fairly strong contrast with the mood of consumers and small businessmen inside Japan. Japan’s household sentiment rose to a 14-month high in May, leading many to conclude that Japan's deepest postwar recession may be easing. 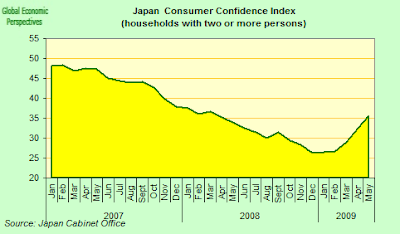 The confidence index climbed to 35.7 from 32.4 in April, according to the Cabinet Office in Tokyo. 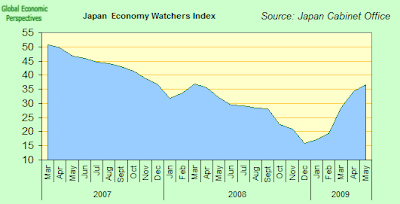 The index has now improved every month since it hit a record low of 26.2 in December. At the same time confidence among Japanese merchants and small traders rose to a 14-month high in May The Economy Watchers index, a survey of barbers, taxi drivers and others who deal directly with consumers, climbed to 36.7 from 34.2 in April, the highest level since March 2008. While the Bank of Japan appears increasingly hopeful that the worst of the slump is or will soon be over, there are plenty of doubts about how robust and enduring any coming recovery is likely to be. 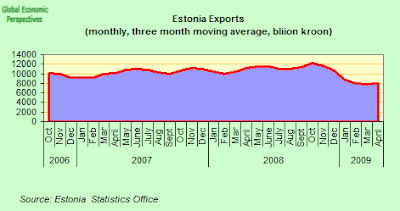 As I am trying to stress it is one thing bringing a halt to the decline in exports, and quite another to ramp them back up again. Many companies are now operating well below output capacity, and there is a limit to how long they can do this without laying off part of their workforce. So unemployment, which has been rising, looks set to rise further. In its world economic forecast, the OECD said Japan’s huge fiscal stimulus packages would begin to support growth from the second half of 2009, but that the economy was nevertheless on course to contract 6.8 per cent in the year as a whole. With the effect of fiscal stimulus set to ”begin to fade” in 2010 and only a ”relatively modest upturn” in world trade expected, the OECD is now forecasting Japanese GDP growth of only 0.7 per cent in 2010. 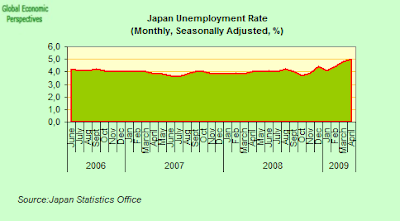 To put this in perspective, if these forecasts are fulfilled Japan GDP will be back at the 2004 level at the end of 2009, and will not reach the 2005 level until 2011, at the earliest. Since these are key years for Japan in preparing to bear the weight of all those extra dependent elderly the output loss is deeply significant. And remember, prior to 2005 we had all those lost years, so another little data point, in 2009 GDP will be only something like 4% up on 1997 - 12 years later! Randall Jones, head of the OECD’s Japan and Korea desk, argues that such anaemic growth will be far from enough to stem the huge output gap, with the liklihood that Japan is set for ”persistent deflation” - an outcome that will only add to the difficulty of addressing the rapidly growing fiscal debt burden. The Cabinet Office’s Consumer Confidence Survey price forecasts are a key indicator of Japanese household inflation expectations. The price forecast index for May, published in June, confirmed that individual inflation expectations have fallen further. 38.6% of survey respondents said that they expected prices to be higher in one year’s time, down from 42.3% in the April survey. This is the 10th consecutive month of decline. At the same time, 22.3% of survey respondents said that they expected prices to be lower in one year’s time, up from 21.6% in the April survey, the eighth consecutive month the percentage has increased. Japan's government went back on 220 billion yen ($2.3 billion) of planned welfare spending cuts this week and effectively put fiscal reform on hold for a decade as it adopted a new long-term reform target to allow it to issue a record amount of bonds to combat recession. 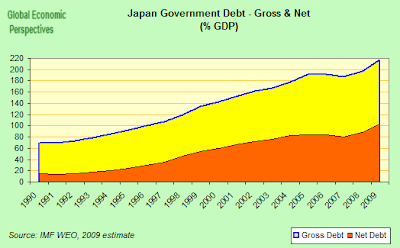 The economic policy outline for 2009, which serves as the basis for compiling next fiscal year's budget, will only add to unease at Japan's ability to manage its colossal public debt. Doubts also abound as the government led by Prime Minister Taro Aso's Liberal Democratic Party could lose power after more than half a century of almost unbroken rule in elections that must be held by October, according to media polls. The economic policy outline points to a fatal flaw common to both the LDP and the main opposition Democratic Party of Japan, which has its best shot ever at taking control: Neither have a credible plan to lower Japan's debt burden and provide a high level of social services to a rapidly ageing population. "Fiscal discipline is a common issue for Japan, the United States and Europe," said Yuuki Sakurai, chief executive and president of Fukoku Capital Management. Senior members of the LDP twice rejected draft versions of the 2009 economic outline, which is drawn up by the top advisory Council on Economic and Fiscal Policy, as they sought to delete a pledge to cut annual increases in welfare spending.Giving up on that pledge and the old fiscal reform target marks a rollback of former Prime Minister Junichiro Koizumi's reform drive to limit spending and reduce the size of government. Japan now aims to stabilise its ratio of debt to gross domestic product by the mid-2010s and to lower it steadily by the beginning of the 2020s, according to the outline. The government also plans to halve the ratio of the primary budget deficit to GDP in at least five years after the economy recovers. The primary budget deficit excludes debt issuance and servicing costs. 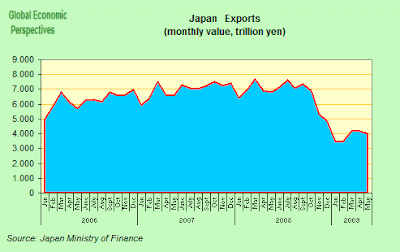 Japan's fiscal condition is the worst among major economies, and the government expects the ratio of its long-term debt to gross domestic product to hit 170 percent by the end of 2009/10. The country's primary budget deficit is expected to rise to 8.1 percent of GDP this fiscal year, up from 3.9 percent in 2008/09. Japan’s debt burden will probably spiral to 197 percent of gross domestic product next year, according to the Organisation for Economic Cooperation and Development. Japanese Prime Minister Taro Aso looks set to abandon a government pledge to curb social welfare spending following a decision of the ruling Liberal Democratic Party this week. Japan is about to drop its goal of trimming growth in the welfare budget by 220 billion yen ($2.3 billion) in each of the five years through 2011 in what is only the latest sign that the country is losing its battle to contain what is currently the world’s largest public debt. Japan's initial goal of a achieving a primary balance by 2011/12 has thus been pushed back 10 years following the government decision to sell a record 44 trillion yen of new debt in the fiscal year to next March to finance both regular spending and stimulus packages. Tax revenue for the year which ended last March came in 5 percent short of government estimates, and the government could issue even more bonds to make up for the shortfall, according to an unsourced report in the Nikkei financial daily. The Cabinet also reiterated earlier promises to raise the ratio of the public contribution to basic pensions to 50 percent after 2010, to recycle laid-off workers into the caregiver industry and to consider tax exemptions with one-time payouts for the poor. The country’s ageing population is driving up spending for medical care and pension payments, and welfare costs are already eating up more than a quarter of this year’s budget. Indeed these costs rose 14 percent from the year earlier even after the government applied the 220 billion-yen spending cap restriction. The deep underlying problem is that this situation is no longer a temporary one. 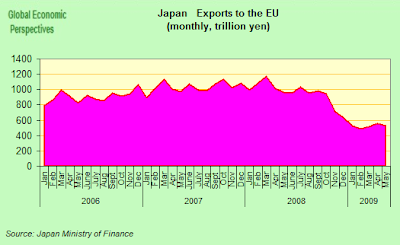 Japan has now been stuggling with such difficulties since the mid 1990s at least, and has become increasingly dependent on exports to live. So the flexibility they are looking for may now simply not be there. The most likely prognosis is that a lot of what we are hearing is election talk, and that the long proposed onsumption tax hike looks more and more probable and imminent. Evening taking the new targets for fiscal consolidation involving a return in the primary balance to surplus within 10 years we may be looking at a 7% rise in consumption tax (from 5%to 12%) as early as 2011. The rhetoric may lead markets to not expect a rise in the consumption tax at any early date, but the reality may be that this is the only option left and that the ground is steadily being prepared for just such a move. Despite the fact that the recession has been extraordinarily deep, and that recovery is bound to be a long, hard and protracted affair, the debate among market participants has now shifted towards possible BOJ exit strategies. In fact a full exit from the monetary easing process is not at all either likely or contemplateable in the short term. However, it is not impossible that the BoJ decide not to renew the temporary measures that are scheduled to come to end in September, like the outright purchases of Commercial Paper and corporate bonds, the Special Fund-Supplying Operations to Facilitate Corporate Financing. 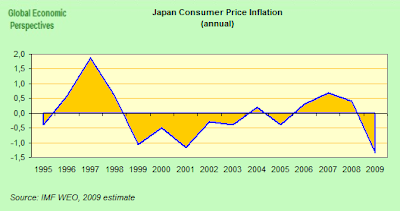 Despite all the speculation the reality is that the BOJ’s view on the economy is still very cautious. Governor Masaaki Sirakawa limited himself this week to saying that the central bank will decide how to deal with the temporary measures “by the end of September in a predictable manner to market participants.” The Bank of Japan also said that the recession is easing as fiscal stimulus measures worldwide spur demand and companies increase production. But Governor Shirakawa has also cited the reduction in inventories both in Japan and overseas as one of the reasons for the bottoming out of the economy, and stressed that it is what happens to final demand - domestically and overseas - after this reduction in inventories comes to an end which holds the key to any long term improvement in the economic situation. In its Monthly Report of Recent Economic and Financial Developments the BOJ revised its basic view of the economy upwards for the second consecutive month. 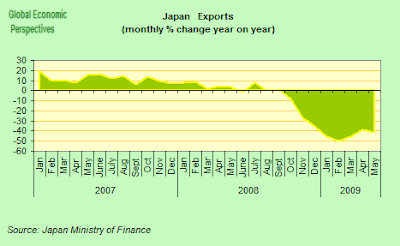 In April, the Bank were saying that “Japan’s economic conditions have deteriorated significantly”, but this was revised in May to the view that “Japan’s economic conditions have been deteriorating, but exports and production are beginning to level out”, and in June to the view that "Japan’s economic conditions, after deteriorating significantly, have begun to stop worsening". This has been widely seen as an indication that the BOJ has revised its view on the economy upward, but the BOJ itself has been trying to discourage this interpretation. At the press conference, Governor Shirakawa said that the BOJ's view on the current state of the economy was in line with the forecast made in the Outlook for Economic Activity and Prices report published on 30 April, namely that “the pace of deterioration in economic conditions will likely moderate gradually and start to level out”, thus emphasizing that the BOJ has not changed its view. To reinforce this point, using the analogy of a weather forecast, he said that if the weather forecast for the following day turns out to have been right, this does not mean that the forecast has been revised. 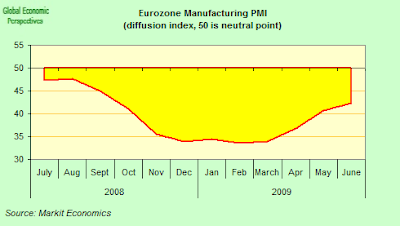 The eurozone economies moved sideways in June, with the flash reading on the composite purchasing managers index (which covers both industry and services) for the 16 nation euro area rising to 44.4, fractionally above the 44 registered in May. So we are just where we were before, contracting more slowly than in Q1, but still contracting, and the fiscal bullet is now almost spent. Not without importance was that the reading came in significantly weaker than the consensus expectation for a sharp increase to 45.3. So the market *has* been getting ahead of itself. On the face of it, the index is now consistent with a quarterly drop in GDP of around 0.5 percent, well below the 2.5 percent fall registered in the first quarter. However - as Capital Economic's Ben May notes - "the index has recently been a poor predictor of growth and the hard data have painted a less upbeat picture." The situation was broadly as expected on the manufacturing front - with a rise to 42.4 from 40.7, but this is still quite a strong contraction. On the one hand the improvement in the factory index is pretty generalized and so, with the new orders-stock ratio rising further, there should be further improvement in the coming months. On the other, given that this upward trend in the factory index is mostly inventory-driven, caution needs to be exercised in extrapolating the tendency to the whole economy. Ben May also points out that the drop in the services PMI from 44.8 to 44.5 suggests that fiscal and monetary stimulus measures "are yet to have a significant impact on domestic demand." Maybe we could rephrase that slightly, their bolt seems to have been shot without result, and the fiscal element, at least in Germany, Spain and Italy will now increasingly have a constraining impact. 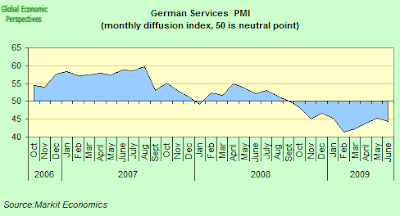 More worryingly, the rate of contraction in Germany's private sector accelerated slightly this month, with flash estimate of the Markit composite PMI falling to 43.4 from the seven-month high of 44.0 in May.The flash estimate for the manufacturing PMI index rose to 40.5 from 39.6 in May, but the flash services PMI reading fell to 44.3 from 45.2 last month. And in the manufacturing sector the ratio of new orders to stocks of finished goods fell back to 1.12 after rising to 1.18 in May. Which effectively means inventories started to rise again. 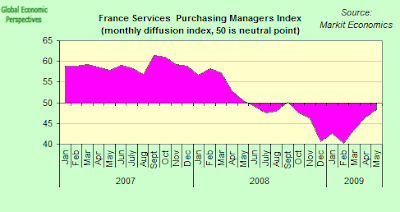 On the other hand, conditions in the French improved for the fourth straight month in June, helped by much slower falls in the level of new orders. 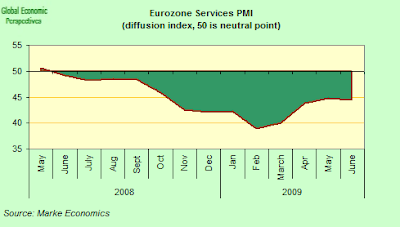 The flash estimate for the Markit/CDAF PMI rose to 47.7 in June compared with 46.6 in May. 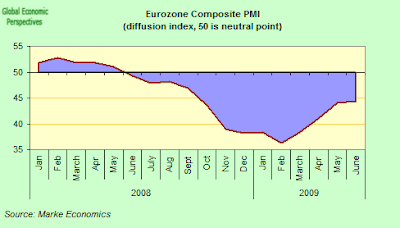 The key to the improvement - according to Markit - was a sharp jump in the composite new orders index, which hit 48.3 compared to May's reading of 45.3, suggesting that demand in the euro zone's second largest economy is steadily on the mend. "The composite new orders index is getting close to stabilisation. We're still very much on course for a strong easing and it does suggest that by the end of the year we could be seeing growth again in France," according to Chris Williamson, chief economist at Markit. 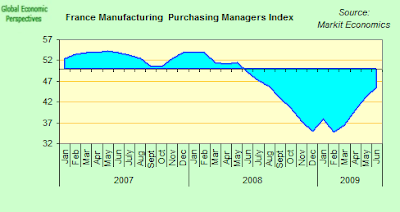 The June manufacturing PMI rose to 45.5 from 43.3, the slowest pace of contraction in activity since August last year. However, Markit cautioned against taking an overly optimistic view of the data, stressing that conditions in the French economy remain fragile, and recovery is likely to be unstable. Just how fragile was emphasised by the fact that the services sector PMI slipped back to 47.5 from 48.3 in May, following three consecutive monthly increases. And just to underline the fragility part, we learnt today that spending by French consumers on manufactured goods fell in May, led by a sharp drop in purchases of clothing and household goods, according to the statistics office INSEE today (Tuesday). Consumer spending fell 0.2 percent month-on-month in May, well below a consensus forecast for a rise of 0.2 percent. Total consumption in May was down 1.6 percent compared to May 2008. That having been said, I have no doubt, and unequivocally, to say that as far as I am concerned France is the strongest (or least weak) economy among the EU big five (France, Germany, the UK, Italy and Spain) at the moment. Risk appetite suffered a sharp deterioration on Monday as fresh uncertainty about the global economy prompted investors to shift from equities, commodities and emerging market assets into the perceived safety of government bonds and the dollar. Markets were further unnerved by warnings on the economic outlook from the head of the IMF and an ECB report saying eurozone banks face another $283bn in writedowns on bad loans and securities this year and next. As Izabella Kaminska notes, it is Southern Europe that is now getting all the attention. As unemployment and bankruptcies surge, bad loans at Spain’s banks rose 4.27 percent of total credit in March, the highest since 1996, compared with 1.2 percent a year earlier. But as Isabella detailed: "Moody’s also noted that a significant government capital injection - which apparently has been discussed for some time now by the Spanish government and the banking sector — could prompt subsequent upgrades of some BFSRs. " And guess what else it might prompt, more downgrades in Spanish sovereign debt, that's what it might prompt. Economy Minister Elena Salgado was widely quoted in the press last week, giving an estimate of 9.5% total fiscal deficit for 2009 (not bad my guess of 9% back in February, I think). But they are still hoping for a contraction this year of only minus three percent, and this seems very optimistic, so the outcome will surely be a deficit in double figures. This, in my view, is the last year that the financial markets will pardon such a deficit from Spain, and we will now be under fiscal pressure as well as relative price pressure. 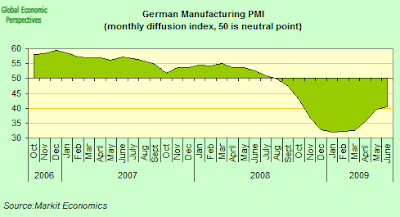 Essentially, I agree with Krugman (or should that be, given the NYT links, Krugman agrees with me) and what we need in Spain is an "internal devaluation" of about 20% to jumpstart the economy - and this is 20% vis a vis Germany, where they are also having deflation, so the size of the correction is very large. And at this point - August will mark the second anniversary of the commencement of what looks like becoming Spain's "lost decade" - we haven't even started. After a decade of explosive loan growth triggered by Greece’s entry to the eurozone, the country’s banks are experiencing the downside of a financial cycle for the first time as the economy stutters in the global downturn. However, the situation may be about to worsen with analysts forecasting bad loans will rise this year from 3.8 per cent to about 6 per cent before peaking in the first half of 2010. Meanwhile, Fitch, the ratings agency, last week warned the banks’ performance for the rest of the year would likely be hit by higher loan impairment charges. So the world seems to work like this. 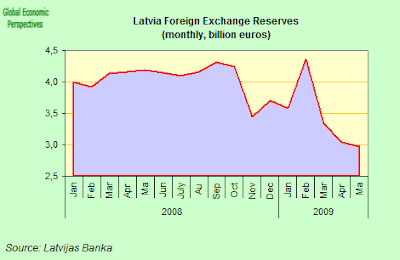 Latvia gets battoned down for a few months via a few billion in loans from the IMF and the EU Commission. 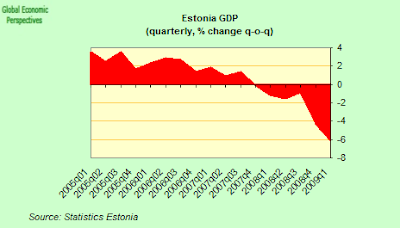 As a result, the Baltics now become yesterday's story - till they aren't again, of course. And we move on, as I more or less feared, and its time to begin to focus on Southern Europe again (while Eastern Europe deteriorates sufficiently to make it back into the headlines). I think people can only keep so many things in their head at any one time. Basically the whole EU system seems to be in denial on what is happening at the moment. The markets have been focused on the East, but they are now starting to wake up to the fact that the South is still here, and when this "matures" we will have a full blown financial crisis, that is for sure. 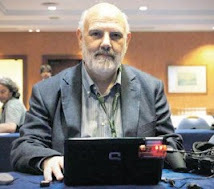 At that poiunt the Spanish and Greek governments will effectively lose control of the situation, just as they have done in Latvia and Hungary. 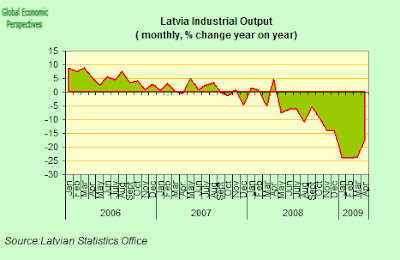 This is one of the reasons I am following Latvia closely. Basically what is happening in the East is a sort of "dry run" for what is going to have to have to happen in the South. 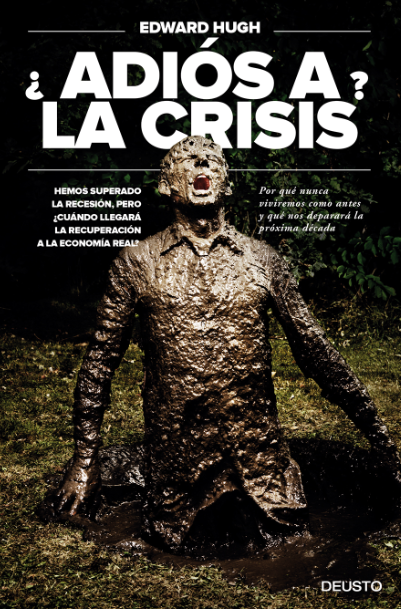 The whole package, from "fiscal austerity" as a tool to attack recessions, to "internal devaluation" via price and wage deflation is about to be applied in the South as a path towards restoring export competitiveness and economic growth. 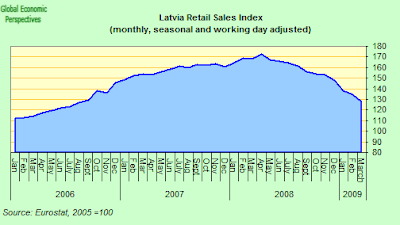 There has been a lot of talk, of late, about the contagion danger from Latvia, but few seem to consider the possibility that - given the way the EU itself is putting its credibility on the line in the Latvian case - if finally Latvia folds (and devalues, as I feel it must), then the contagion problem could leap straight to the South from the East. Obviously Romania is looking very vulnerable to anything that happens virtually anywhere, but Spain looks a lot more vulnerable to me at this point than either Poland or the Czech Republic, due to the massive external financing requirement. Basically investors have now started to remember that Greece and Spain still exist. I suppose we will now see the crisis zigger-zagger across from the South to the East and back again, with the German real economy receiving body blows on both counts in the middle. Meantime in Berlin and Frankfurt they seem to be mainly worried about the US fiscal deficit at this point. Stange what makes people tick. I have had a nice weekend not least because I have finally received my new laptop and as the first, of many, blog entries to be typed I would like to point your attention to some recent comments made by the German finance minister Peer Steinbrueck in the context of the increasing risk of further downgrades of European sovereigns following the decision by Standard and Poor to downgrade Ireland's debt rating for the second time in 2009. As I think a bit about what it actually is Mr. Steinbrueck is saying I cannot help but feel that our good Finance minister is perhaps feeling a bit too smug here. Now, as Mr. Steinbrueck points out and as has been the source of wide debate, this is an issue which reflects itself in the widening of sovereign yield spreads among economies in the Eurozone (picture courtesy of Ibex Salad). Now I am not sure that Mr. Steinbrueck really intended to come off as smug. 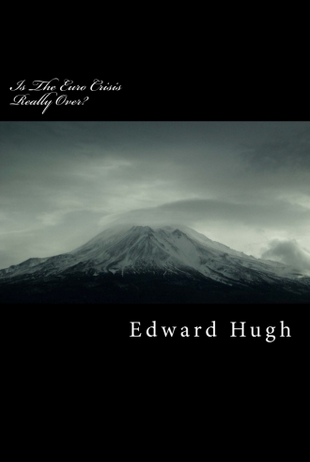 In truth he may just be concerned, and rightfully so, about Germany fellow Eurozone members and perhaps even the ability of the Eurozone to weather the incoming crisis as one entity. However, I do think the following is rather complacent when you think that it comes from the finance minister of an economy with more than a few problems, not least on the fiscal front. Ok, fair enough Mr. Steinbrueck. I for one will not accuse you of being blind further down the road, but I do think a bit of humble pie is in order here. Consequently, there are two risks here. On the one hand there is the narrative Steinbrueck is latching on to in the form of the periphery acting in such a reckless way that they risk pushing themselves so far into the mire that it risks the future of the Eurozone or, if we move the predictions down a nudge, their own economic prosperity. The other risk however is a much more sinister one. Consider then the idea that the threat towards economic stability in the Eurozone comes not from the periphery but from the very core of the edifice in the form of a German economy whose growth model is extremely vulnerable to the current conditions and which has no meaningful defense. The idea here is simple enough. As bad as the crisis in the periphery is, bad indeed it is, what happens when markets wake up to the fact that the weakness and dysfunctional economic edifice stretches into the very heart of the Eurozone? Specifically, what happens to those much hailed better conditions in the context of Germany Steinbrueck points towards? Clearly, there is ground for more than a little food for thought here and especially so in the context of Germany who has now definitive lost the source of its hitherto export driven growth in the form of a faltering CEE as well as a severe crisis in its main Eurozone trading partners. But, by no means does Mr. Steinbrueck stop here. Steinbrueck signaled disappointment that the G-8 failed to choose stronger language today on “exit strategies” to the financial and economic crisis, such as scaling back government borrowing and withdrawing monetary policy stimulus. Now, if I feel that Mr. Steinbrueck was coming off as a bit too complacent on the first account I seriously think he is moving ahead of himself on this one. I don't know where this comes from, I really don't. Perhaps it is all the talk about rising yields on the long end of the yield curve in the US and the subsequent prediction that the Fed will soon head north to reflect better than expected conditions (and thus inflation). Consequently, I can't for the life of me understand why a German finance minister would be talking about exit strategies at this point in time. Surely, I respect being ahead of the curve as much as the next guy, but not to the extent that you start making assumptions about a recovery which is clearly not in the offering. Put differently, yes James, I do see what you see but not everybody does it seems. Sorry, but I cannot stress hard enough that talks about exit strategies and inflation fighting seem to me to be rather counter productive at this point in time; especially in the context of the Eurozone and Germany. Too Smug for His Own Good? Well, perhaps I am being a bit unfair here. I mean, here I am trying to find something to blog about a late Sunday afternoon and my gaze falls upon Mr. Steibrueck's latest escapades. The biggest issue here I think is really that Germany may not be as "safe" as everyone beliefs. The idea of Germany as the Eurozone anchor is about to be tested now and I have my doubts that the narrative will hold up for scrutiny. Of course, a couple of quotes ripped from Bloomberg are not exactly a solid foundation but, in this context, I would still venture the claim that Mr. Steinbrueck is being a bit too smug here. China’s exports fell by a record in May as the global recession cut demand for goods produced by the world’s third-largest economy. Overseas sales dropped 26.4 percent in May from a year earlier. That compares with the median estimate for a decline of 23 percent in a Bloomberg News survey of 15 economists, and a 22.6 percent contraction in April. The decline was the biggest since Bloomberg data began in 1995. And more to the point as far as Brad is concerned China’s imports dropped 25.2 percent last month, compared with a 23 percent fall in April. Hence China just one more time ran an increased trade surplus (up to $13.4bn in May from $13.1bn in April), and it is no clearer to me than it is to Brad how a country running a trade surplus can be leading a surge in global demand. Indeed this months data, far from prodiving evidence of an accelerating "recovery" continues to point towards ongoing weakness in global demand, just like the evidence we are receiving from Germany, and from Japan. 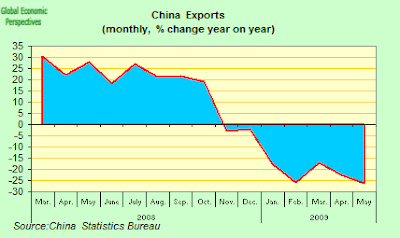 The development in China’s exports was weaker than expected. According to our own seasonally adjusted data, exports edged up slightly and the overall picture remains that China’s exports have stabilised in recent months. However, the rebound in China’s exports since early this year has been weaker than in most other Asian countries, suggesting that the Chinese recovery story has been a major driver in Asian countries’ export recovery in recent months. This is confirmed by the continued strong growth in China’s imports. According to our own seasonally adjusted figures, China’s imports soared ahead 5.8% m/m in May following an 4.9% m/m impressive jump in imports in the previous month. China’s imports of commodities such as iron ore, coal and crude oil have been extraordinarily strong, increasing speculation that China is currently building strategic inventories of the most important commodities (see chart on next page). For that reason, Latin America (not least Brazil) and the ASEAN countries have benefited recently from China’s strong import volumes. On the other hand there was a 38.7 percent year on year rise in fixed asset investment in May. This was an even larger increase than the one registered in April, when FAI rose 33.9 per cent. For the first five months of this year, investments increased 32.9 per cent from the same period in 2008, compared with 30.5 per cent in the first four months of the year and against an estimate of 31 per cent. According to Alaistair Chan, at Moody’s Economy.com. “Fixed asset investment in China continues to increase on the back of state-directed projects ... This will help keep the economy growing but there are increasing concerns about the amount of lending that has been required to fund the projects"
Quite. And as a Chinese economist friend wrote me to say: "just how much of the current property demand is speculative? I also have my doubts whether even official inventory levels accurately reflect all the inventory out there, especially when I read anecdotes like this ... "
As a Beijing homeowner myself, I’ve experienced this puzzling phenomenon firsthand. We have been told that the value of the condo we bought last year has gone up 30% based on sales of new nearby developments, but it’s impossible to confirm since there is no secondary market. Originally we tried to rent the place, but we couldn’t find takers at any price that could remotely cover the mortgage, despite a prime location. When we decided to move in instead, we discovered that while the building was sold out long ago, hardly anyone actually lives there. Same with another 800-unit project down the street: every unit went for top dollar well before completion, but now the lights are off and nobody’s home. In fact the volume of empty apartments across the country hit 91million sq metres at the end of last year, up 32.3 per cent from a year earlier, according to official figures. But those numbers included neither the huge volumes of completed real estate projects whose owners are waiting for market conditions to improve before they put them on the market, nor the estimated 587 million sq m of apartments sold in the past five years but left empty by their owners. But as capex growth keeps humming along..(we could ask)..does the world really need more manufacturing capacity at this juncture? .....(it all)...of course, begs the question of who the Chinese plan on selling to. It's all well and good continuing to build factories and export capacity, but the real world isn't like Field of Dreams; just because you build it doesn't mean that customers will come. Yesterday's US trade figures were telling in that regard. Imports declined again in April; while an inveterate "second derivative" believer may find reasons for optimism in the slight lessening of the pace of import decline in yesterday's data, Macro Man is rather more sceptical. And the fact that US exports declined as well suggests that domestic demand in the rest of the world remains flaccid at best. So, and finishing up where I started, with the trade balance, as Brad said: "China needs to import more – and not just import more commodities for its (growing) strategic stockpiles". However, to quote again my Chinese economist friend: Macroman's data on China's imports of commodities is surreal too. To which Claus Vistesen responded: "Yep, this was what I thought, and we should expect Brad Setser to be all over this". We certainly should, we certainly should. On you go Brad. German exports fell more than economists forecast in April as the global crisis restrained demand, keeping Europe’s largest economy mired in a recession. Sales abroad, adjusted for working days and seasonal changes, fell 4.8 percent from March, when they rose a revised 0.3 percent, the Federal Statistics Office in Wiesbaden said today. Economists expected a 0.1 percent decline in April, according to the median of 10 estimates in a Bloomberg News survey. 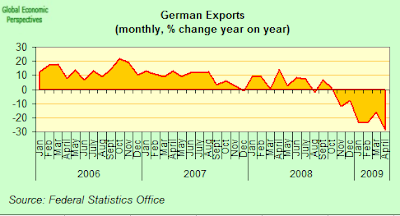 So German exports have not touched bottom yet - they are still falling. 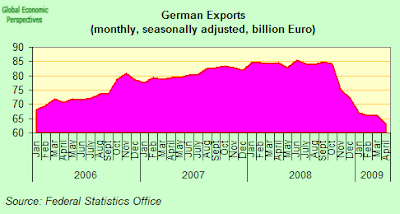 Since the German economy is export dependent, then this implies the obvious, the German economy is still contracting. I don't think anyone ever doubted this, but looking at the way some of the material has been presented recently, it wasn't always clear. Indeed year on year, exports fell by 22.9%, the fastest rate so far, although since these annual stats are not working day corrected I wouldn't read too much into that just yet, since you really do need to average across March and April due to the Easter impact. 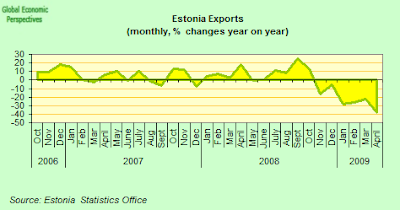 Another country where rather unsurprisingly we aren't seeing too many green shoots at the moment is Estonia, and only today the statistics office reported that exports decreased by 38% and imports by 41% (year on year) in April. 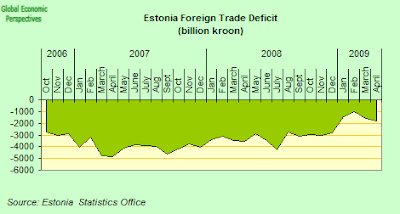 As a result the Estonian trade deficit rose for the second month running, and hit 1.8 billion kroons. So what we are seeing here is a distinct move in the wrong direction, on both counts. 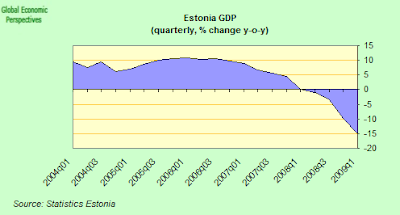 We also learnt from the Estonian stats office today that GDP contracted by 15.1% (year on year) in the first three months of this year - a figure which was revised down from the earlier flash estimate of 15.6%. Compared to the 4th quarter of last year, seasonally and working-day adjusted GDP decreased by 6.1% (more on all this in another post). 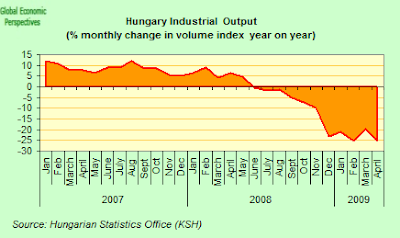 Finally on the green shoots front for today, we could note that Hungary's industrial production plummeted in April by 25.3% (year on year) according to working day adjusted data released by the stats office. This compares with a year on year contraction of 19.6% in March. Month on month there was seasonally and working day adjusted drop of 5.1% in April, following 4.5% growth in March. 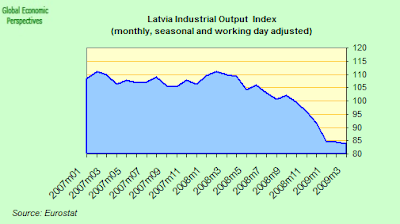 So again, output is still falling, and no bottom has been reached. This latest Hungarian data is particularly unpalatable following a number of reports which had been left open the possibility that the downturn in the Hungarian economy had ground to a halt, or at least staretd to decelerate. If industrial output shows similar weakness in other East European countries then this does not augur well for future German and eurozone output, since Hungary plays a significant role in the early stages of the European manufacturing production chain.